The cordless ratchet is one of the most influential tools in the auto industry. It’s not limited to only auto mechanics; its diversity has made it span over multiple trades. Its unique architecture has solved an age-old mystery. How to get leverage when you have minimal space? We will cover how to select a cordless ratchet based off of the features and benefits that meet your needs. Additionally, some safety tips to keep you safe in the workplace. What’s inside a cordless impact ratchet? How to choose a cordless electric ratchet? Our pick for the best cordless ratchet is the Milwaukee 2457-21 3/8-in Cordless M12 Lithium-Ion Ratchet. Milwaukee has an exceptional tool line and their cordless ratchet fits the part. It has foundational M12 battery technology to extend its work life. It uses its powerful 12-volt motor to provide 35 ft-lbs of torque. This combo makes it our top choice for the consumer. The Milwaukee ratchet is the best in class in power, speed and durability. When you use this wrench, you can expect top of the line performance. This model utilizes M12 lithium battery technology to maximize power and work life. You can be assured that this wrench can get multiple jobs down on one charge. With a 12 volt motor, the Milwaukee can output a heavy load of 35 pounds of torque. This gives you the power of a pneumatic ratchet minus the air hose. The Milwaukee pack 250 RPMs of speed into its small frame. This should fit the bill for any job in-front of you. This model is not only best in class for power, speed, and durability. It’s best in class for extreme worksite conditions. You can be your ratchet will work in tough work conditions. With its small frame, you can slide this tool into a tool belt. It’s also ideal for sliding down into an engine bay. This ratchet also comes with a variable speed feature for optimal control. Its steel frame also provides durability. Milwaukee provides an incredible 5-year warranty with this ratchet. In addition, they provide a support line. If for some reason you’re having issues this is an ideal manufacturer. The VonHaus provides variable speed control with a max of 280 RPMs. This gives you control over your torque. This ratchet is equipped with a powerful 12-volt motor which can output an amazing 35 pounds of torque. This model has a fuel gauge which comes stock which helps you monitor the battery life. It provides three colors green, red, and amber to signal. The VonHaus comes with an anti-slip design. With the forward/reverse switch and a soft grip you’re able to reach into tight spots and hard angles. The ratchet also provides an LED light which comes in handy for auto use. You’re able to shine some light in dark nooks under the hood. The VonHaus comes with a lock switch to prevent false starts. A nice little safety feature goes a long way. This ratchet comes in a compact size designed to give you the flexibility needed to reach into tight working spaces. VonHaus has developed a communication system between tool, battery and charger. This provides optimal power usage and protects both your motor and your battery. VonHaus comes with a 1-year warranty. However, by simply registering your tool on their website you can receive a free extended warranty. The ACDelco comes with a spark-free brushless motor system. Proven to be more precise and efficient the ACDelco motor has a longer lasting life up to 50 percent. This model comes with an alloy head and body for durability and strength; engineered for top performance. The ACDelco comes with anti-slip technology architected to reach into tight spots at various angels. This model also comes with an LED on board to brighten up shadowed places under the hood. This ratchet has a built-in safety lock system with rubber grips for maximum control and safety. With a high powered lithium battery combo’d with the brushless motor system you’re going to receive a highly effective tool. The lithium battery also comes with a fast 30-minute charge system for any worker on the go. The ACDelco comes with a variable speed switch to give you precise control when in operation. This ratchet also comes with a metal gearbox to ensure top of the line quality. The motor system provides high power to weight ratio which gives you better control. The ACDelco ratchet is one of the few power tools that provides a lithium battery pack with the tool. This will save you some money not having to purchase this additionally. This Milwaukee model comes with a 12-volt motor which gives you plenty of power for any type of job. This make offers 30 lbs of torque, it can handle some of the most stubborn nuts that might be frozen. The ratchet outputs up to 250 RPMs of speed. This Milwaukee model stores a lot of speed in a small frame. The LED light onboard provides a good amount of light when you’re down under the hood, or in a low-lit environment. Weighing in at 1.8 lbs it’s one of the lighter models on the market. Like its counterpart this model is best in class, speed, and durability. You can be assured that you have a quality tool in hand. With M12 REDLITHIUM technology sourcing the power, this ratchet offers more work hours and charge than competing models. This model also comes best in class in extreme work conditions, so you can have confidence that the ratchet is not going to quit on you in a pinch. With its compact size you can slide it in your work belt. It’s perfect for sliding down into engine bays and getting to that tough nut. To give you precise control it comes with a steel variable speed trigger. You’re able to control the RPM output for different scenarios. Milwaukee products come with one of the best warranties on the market. Your tool is under warranty for 5 years. With one of the highest RPMs on the market this ratchet can move up to 220 RPMs. It has enough speed for any of your projects. The AOBEN comes with a 12-volt motor and provides plenty of power for some of the most stubborn nuts. This ratchet outputs 40Nm of torque, which is on par with competitors in the market. The AOBEN has an onboard LED to help you navigate through dark engine bays or low-lit garages. This ratchet comes with a lock-in power switch to prevent any false starts. A nice added safety feature to prevent any accidents. This model comes with an angular impact function to help improve efficiency. It has a lithium ion battery to provide sufficient power to the motor and extend the work life. The AOBEN comes with an air-cooled motor system which prevents overheating. AOBEN offers a unique warranty with a 100 percent money back if you’re not satisfied with the ratchet. This ratchet comes with 2 batteries included in the purchase. Additionally, AOBEN provides a set of 8 sockets. This is the most well-rounded purchase with these added items. Weighing in at 3.5 lbs this ratchet is lightweight and compact for working in tight spaces. ​The cordless ratchet has made seemingly impossible jobs become plausible. The intricate design of most engine bays leaves little room for tools, much less hands. The compact design of the cordless ratchet gives you incredible torque when there is no room for leverage. The question you might have is which one is right for you? We’re here to help you navigate through the various features and benefits that come with different makes and models. Our aim is to give you enough information to equip you to find the best cordless ratchet for you. 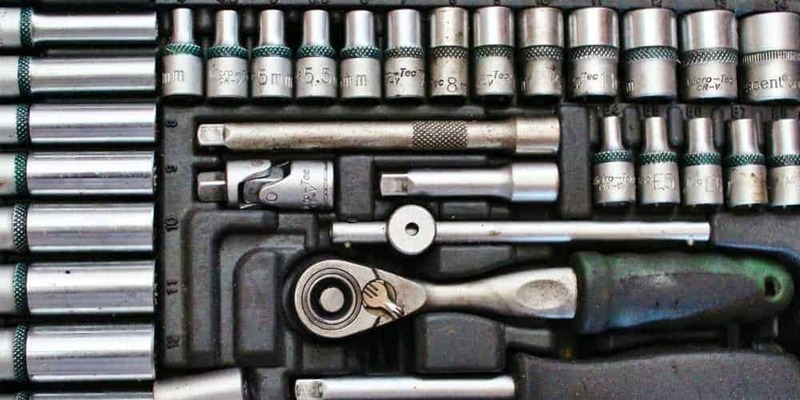 Most homeowners will own a basic wrench set. 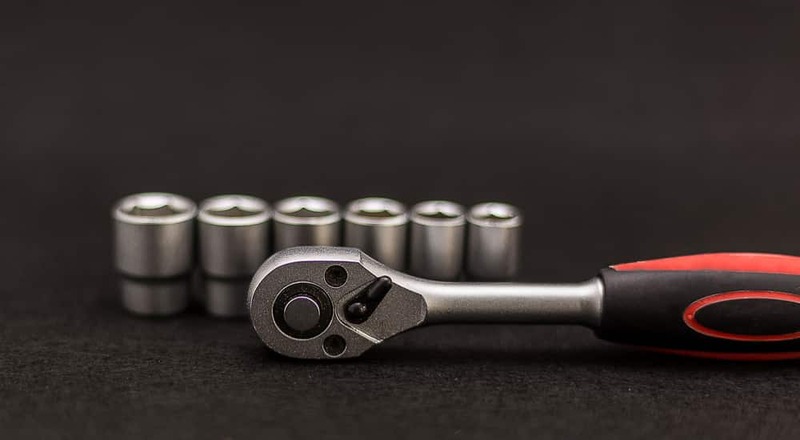 The wrench is the most common way to loosen or tighten a bolt. However, with the need to work quickly and efficiently the ratchet was developed. The ratchet was a huge leap forward, but like the wrench, the ratchet depended on leverage to provide torque. It has similar benefits to its counterpart the pneumatic wrench, but minus the cord. The cordless ratchet also referred to as a power ratchet is an improvement upon the socket wrench. When it comes to working in tight corners or small spaces leverage becomes a precious commodity. The problem comes up in various scenarios, not only limited to engine bays. You can find yourself in a tight bind between two wall studs, or under a sink. The cordless ratchet was engineered to solve this problem. With the body of a common ratchet, it possesses the technology to provide enough torque to loosen or tighten any nut. If you find yourself scratching your head and staring at a bolt deep in an engine bay this tool is for you. Even though the mechanism of the cordless ratchet operates as smooth as butter this small tool is complex in nature. It contains a handful of components inside its small frame. Motor – Like every power tool a motor is necessary to provide power to the tool. The models we suggest all come with a 12-volt motor. Even though the ratchet rotates in two directions most designs have the motor rotate one direction. Battery – The type of battery differs from each manufacturer. Some manufacturers invest in battery technology to provide a more efficient motor and a longer work life. Gears – The motor spins a set of gears to control the RPMs of the tool. Certain ratios are pre-set by the manufacturer. Crankshaft – Similar to a car the crankshaft drives the tool. It rotates the actual rather head. Yoke – The yoke is a component which swings back and forth and turns the pawl. The pawl is connected to the forward/reverse connection on the back of the ratchet. When choosing a cordless ratchet you want to consider a few key elements, torque, grip, size, and durability. Torque – Torque is probably one of the biggest factors in play with a cordless ratchet. It’s the driving force that loosens and tightens the bolts. You’re going to need a ratchet that will provide a range of 30 to 40 ft-lbs of torque or the ratchet will do you little good. Size- Having a small bodied ratchet is key to fitting into tight workplaces. Let’s say you have incredible torque, but you can’t fit the ratchet into an engine bay or a tight corner. What good is it? Look at the length and the circumference. You want to be able to hold it with one hand comfortably. Grip – Having a comfortable grip on the tool is vital to using the cordless ratchet. Seeing how you’ll be holding it at various angles a good grip is needed. Some ratchets come with anti-slip grips, this is something to take into consideration. Durability – Because the cordless ratchet is made of intricate components you’ll want to make sure it’s durable. There will be times it will slip from your hands or tool belt and bounce around the garage floor. Make sure your ratchet’s body is mostly metal. This will ensure that it can handle some lofty falls. Some minor aspects to look at are extra accessories. Some cordless ratchets come with enhanced battery technology to give you more work life. Others come with quick charge features and LED lights. Find out what works best for you. When using the cordless ratchet there are a few best safety practices to be mindful of. Be sure to wipe your work area down. If you can make sure to wipe any excess grease from the bolt or nut before use. Make sure to fasten socket to ratchet before operation. Be sure to read the owner’s manual to understand every feature of the ratchet before you operate it. Some cordless ratchets come with lock features for the power switch, be sure to utilize them. When working with any power tool it’s advised to wear safety glasses during operation. When it comes to using any power tool it only takes one mistake. Be mindful of your environment and please store where children can not reach. To extend the life of your cordless ratchet you’ll need to keep up with proper care and maintenance of your tool. Do not push your ratchet when it’s locked to a frozen bolt. Doing so could cause damage to your motor. Store your tool properly. If it comes with a case store in the case when not in use. Make sure your batteries are fully charged when starting each project. This will not only help your batteries, but it will put less stress on your motor. Wipe your ratchet down with a dry cloth after every use. This is especially true when your working on a car. Additionally, be sure to wipe down the sockets you used to prevent future stripping. Inspect your batteries periodically to make sure they’re working properly and are charging. If you find your battery not working properly call the manufacturer. Q: Cordless ratchet vs impact wrench? A: The cordless ratchet is designed to hold sufficient torque inside of a small frame. It makes the tool flexible and able to reach into small nooks. The impact wrench has more torque and power and works well for projects in which you have the luxury of space. It comes down to what kind of environment you’re working in and what type of project. Q: Can I fix my cordless ratchet? A: If you have enough knowledge of the tool and understand the engineering, yes. However, I would check with the manufacturer. 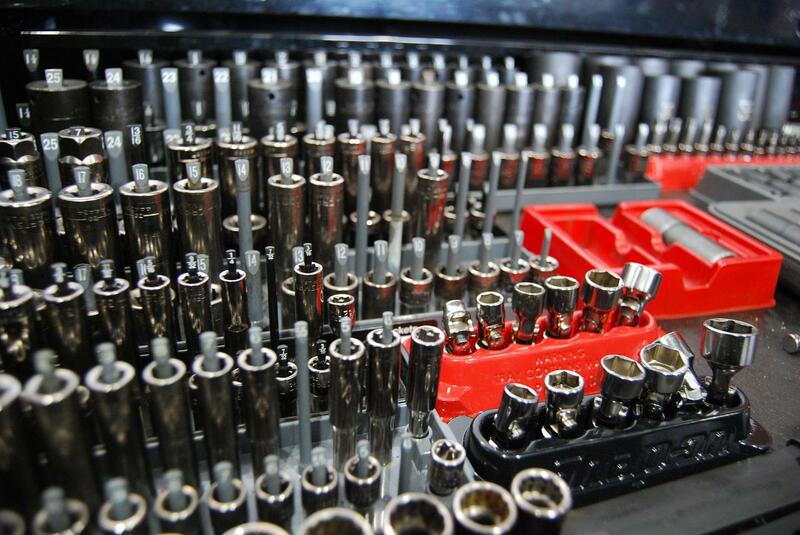 Some manufacturers have technicians available to help repair your tool. Q: Is the cordless ratchet small enough for most tool belts? A: Yes, most cordless ratchets were designed to fit into tool belts, which helps them become portable. Q: Do cordless ratchets strip bolts? A: If you’re not mindful of the speed setting you’ve set your ratchet to. Most cordless ratchets come with variable speed options. Additionally, be mindful to use the correct socket size. Q: What is the best way to clean my cordless ratchet? The Milwaukee 2457-21 3/8-in Cordless M12 Lithium-Ion Ratchet is our pick for multiple reasons. Milwaukee has a prestigious product line and this cordless ratchet is best in class. It has a 12-volt motor with up to 35 lbs. of torque. Its small frame is made of steel for durability and the ratchet can reach up to 250 RPMs. We feel that the Milwaukee 2457 model is the best deal for the consumer. If you’re on a budget but you need a cordless ratchet the VonHaus Cordless Electric Ratchet is a great option. It outputs a surprising 280 RPMs and is equipped with a 12-volt motor as well. It also comes with an LED light accessory that does not come standard with most cordless ratchets. If you would like to get a premium product, the ACDelco 3/8-Inch Li-Ion 12V Cordless Brushless Motor Ratchet is a great option for you. It comes with lithium batteries included which will save you on initial cost. It also provides a fast charge system which is ideal if you’re in a pinch and need to move quickly.